The prospect of Boston gleaming on the world stage, flush with jobs and served by an upgraded transit system, clashed with dire warnings about nightmarish traffic, steep cost overruns, and misplaced priorities in a sometimes testy debate Thursday between Olympic organizers and opponents. The chairman of Boston 2024 and a top official at the US Olympic Committee, under pressure to raise the bid’s sagging poll numbers, ardently defended their budget and commitment to transparency, and said Boston should use the Olympics to spark long-needed improvements. 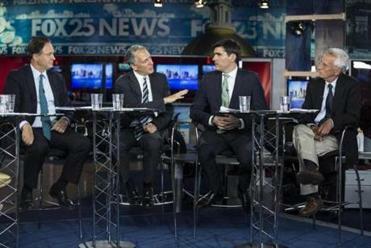 Analysis and reaction on the Boston Olympics debate from Globe columnists and reporters. The hour-long debate, sponsored by the Globe and Fox 25, drilled deeply into the minutiae of Olympic finances, with squabbles erupting over the value of MBTA air rights and tax subsidies per square foot for a decking that would need to be built for the Olympic Stadium at Widett Circle. But the debate also featured some pointed and personal barbs, reflecting how the divisive the Olympic bid has become in Boston since the city was chosen by the USOC in January. One heated exchange centered on the potential for traffic jams during the Games. But Dempsey said that traffic was light because the mayors of host cities often told their largest employers to keep their workers home during the Games. Seeking to appeal to the hometown audience, he painted Doctoroff as an out-of-town Olympic honcho trying to dictate Boston’s future. “For you to come up from New York and tell us you have a better way to run our city,” Dempsey scolded, as Doctoroff waved away the jab and asserted that even skeptical host cities end up loving the Olympics. “In fact, if you go back to the cities and ask people in the cities, are they glad that they hosted the Olympics, it’s overwhelmingly, yes,” he said. Zimbalist was often the aggressor, persistently skewering what he described as Boston 2024’s sloppy budgeting. He contended, for example, that the bid does not account for the cost of government services that would be needed if Boston 2024 transforms Widett Circle into a thriving new neighborhood. Turning to the central issue of taxpayer risk, opponents said that if there were no danger of cost overruns, Boston 2024 should not require the city to sign a financial guarantee to cover the costs the Games. Pressed on the issue of transparency, Pagliuca said that the group would release on Friday a completely unredacted version of the original bid it submitted to the USOC in December. The group had for months refused to release the bid in its entirety. Under pressure from the City Council, which was threatening to subpoena it, Boston 2024 relented on Wednesday and said it would release a full version. Thursday’s debate, moderated by Maria Stephanos of Fox 25 and Sacha Pfeiffer of the Globe, marks the start of a critical two-month period that could determine the fate of the faltering bid. In mid-August, a consulting firm hired by the state plans to issue its analysis of the potential for cost overruns and financial liabilities the state could face if Boston hosted the Games. The report could determine whether Governor Charlie Baker, who has remained steadfastly neutral on the bid, decides to support the Olympic effort and give it a much-needed boost or whether he opposes it, which could effectively kill the project. Then US Olympic Committee must decide by Sept. 15 whether to send a letter to the International Olympic Committee that would officially nominate Boston as the US bid city for the 2024 Games, with the winner selected in 2017. Probst said he would like support at 50 percent “relatively soon” and in the mid-60s by 2017. Mayor Martin J. Walsh has indicated he would like support reach 70 percent in Boston. The most recent poll, by WBUR in July, showed 40 percent of voters statewide supported the bid, while 50 percent opposed. In Boston 44 percent were in favor and 48 percent were opposed. After lurching from controversy to controversy, including winter storms that undermined the public’s confidence in the transit system, the group shook up its leadership team in May. Boston 2024 named Pagliuca as its chairman, replacing John Fish, the hard-charging construction executive who was the founder and driving force behind the effort. Pagliuca moved quickly to try to push Boston 2024 past its rocky start. In late June, he unveiled “Bid 2.0,” a revised plan that put a greater emphasis on the benefits that Olympic organizers believe Boston would reap long after the Games. The updated blueprint laid out plans to build two new neighborhoods with thousands of housing units at Widett Circle in South Boston, where the temporary Olympic Stadium would be built, and at Columbia Point in Dorchester, where the Olympic Village would be located. Bid leaders also sprinkled venues across the state, relocating as far away as Western Massachusetts and New Bedford. Critics have pointed out that even the revised bid did not answer all the outstanding questions. It had no location for an Olympic velodrome, aquatic center, or 1-million-square-foot media center, three of the largest and costliest venues at past Games. Bid leaders have said they are still searching for appropriate sites for those venues.